Michael Physick is Canadian. But, save for the occasional accented vowel that sneaks out, you’d easily mistake him for a laid-back SoCal native. Music has been a part of his life since he was a pre-teen. Life has taken him from the great white north to sunny Southern California, where he has taken advantage of the opportunities Seal Beach and Orange County have offered him. Born in Vancouver, Physick grew up with a family that supported his musical bent and put him in guitar lessons for a year as a pre-teen. But he took off from there, and has been “completely self-taught,” he says, in his singing and the several instruments he now plays. He was part of a band in high school and college that experienced local success and gained a following. But at the end of college, they went their separate ways. He started a career as a music and math teacher at a private school, and had two daughters. But in 2007, needing a change of scenery, he decided to relocate to Southern California. Physick says Pless welcomed him with a hug, taught him to surf in a short period of time, and saved him from what could have been a hard first year away from home. In the meantime, Physick met Trina, whom he calls the California girl of his dreams. The two were married, and settled in with their blended family. After several years of focusing on a new job, new marriage and raising children had forced his music to the backburner, Trina encouraged Michael to get back into it. He played an open mic night at Bogart’s in 2016, and was such a hit that he began to be offered more and more gigs around town, including at O’Malley’s, Hennessey’s and Mahe. He was playing one night at Bogart’s when he got the call from his pregnant wife, saying their first son was on his way. He left Bogart’s with the regulars cheering him on. Michael has since expanded his repertoire, not only playing gigs, but making himself available as a musician-for-hire to play weddings and private parties. He can be hired out on his own, or as part of the Michael Physick Trio, or as part of a new and innovative act he calls MP4, a DJ/Band fusion act. Physick and his family live in Cypress, with his kids going to Los Alamitos schools. But his ties to Seal Beach run deep. One of his daughters works and sings at Bogart’s, and his wife is one of the owners of Spa Wasted on Pacific Coast Highway. Michael is beginning to write original music, and hopes to film a music video for one of his songs in Seal Beach. 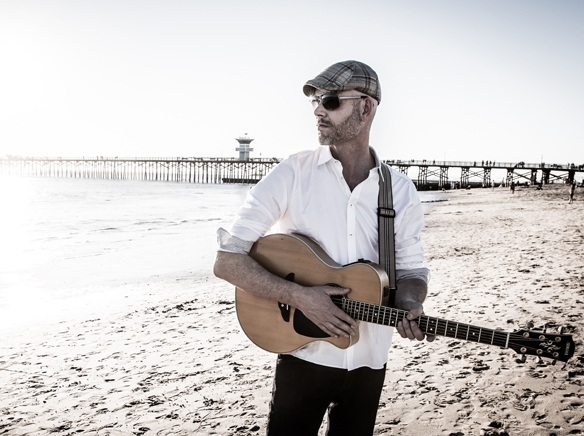 That song, “California Love at First Sight,” about his first date with Trina, will be played live for the first time at his concert in Seal Beach on June 27, when Physick and his band will kick off the Summer Concert Series at 6 p.m. at Eisenhower Park. The first hour will be the Michael Physick Trio, and the second hour will be the DJ/Band fusion. Physick also plays regularly at the House of Blues and The Fifth in Anaheim, in addition to numerous events around various parts of Southern California. See more at michaelphysick.com, or follow him on Facebook and Instagram @michaelphysickmusic.